It’s not often that I write about Spanish wines, this is in fact being the first time I’ve done so in years. It’s not because I do not like Spanish wines, but rather because there are many other writers more committed, and more immersed in Spanish wine than I am, and I am happy to follow their work. Writing about wine often requires more than the ability to taste and write. It requires perspective, a historical framework within which to comment intelligently about current releases and a bit of geological knowledge. This is particular true when it comes to the most famous regions of Spain. Rioja, Priorat, Ribera Sacra, etc. They all have histories and terroirs that need to be understood if they are to be explained, and they certainly need to be explained if the wines are to be understood. But what happens when something new is created. Where the will of a man and a woman, has forced something to burst on to the scene where nothing similar had previously existed. That is the case with Dominio Buenavista, home of Veleta wines, and what happens is a certain liberty to explore without prejudice or bias. While I have not followed the work of Nola and Juan Palomar from the very beginning, which would stretch back only to 1992 when they planted the first vines at the familial estate of the Palomar family, I have been fortunate to have tried the wines from some of the earliest vintages. Additional vineyards were planted throughout the 1990s with a winery finally coming into production only in 1999 making earlier vintages also not that old. I first met both Nola and Juan in a small Spanish restaurant in New York City where we tried a few of the recent releases. That was almost a decade ago in 2008. Over the years more than a few examples of Veleta wines have crossed my path. The quality of the wines has moved from strength to strength, while the range simultaneously has expanded. From a quartet of early wines Veleta’s portfolio has now expanded to include a dozen wines featuring a pair of sparkling wines as well as a selection of reds, whites, a rose, and even dessert wines that each offer value. Their secret? Besides passion and skill, credit must be given where credit is due. The province of Granada is not known as a particularly distinguished wine-producing region. That may very well be more of a logistical problem as opposed to a question of terroir. 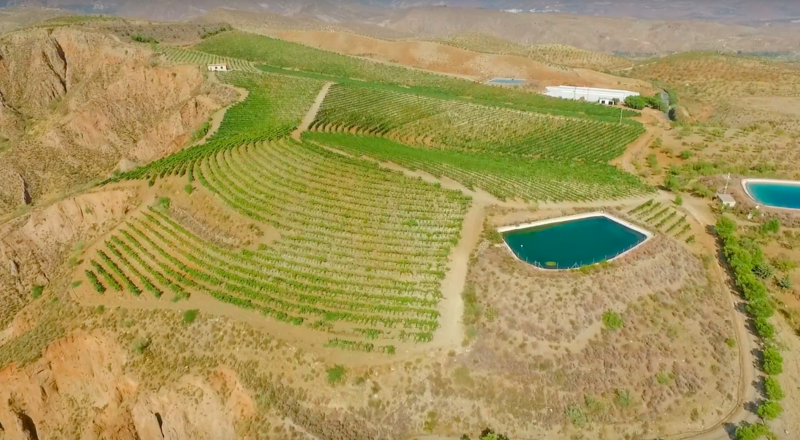 The slice of Spain where one finds Dominio Buenavista is a relatively remote strip of land buffered to the north by the Sierra Nevada mountains and laying some 20 or so miles from the Mediterranean sea. With few major populations centers nearby, the market for the wines of the region have remained local for millennia. While we may not be familiar with the wines of Grenada, we might all owe them a debt of gratitude, as this is one of the regions of the world where wild vines were domesticated, according to reports in this case, some 4,500 years ago! The vineyards of Dominio Buenavista are carved out of the foothills of the Sierra Nevada mountains, planted in orange tinged soils of clay and slate located above 650 meters (2200 feet) in elevation. The altitude keeps the climate here temperate and the proximity to the Sierra Nevadas provides spring season rains that fill reservoirs, which in turn keep the vines healthy through the typical drought months of summer. Low-level stress during the growing seasons, and mineral rich soils provides these wines with the verve and nuance that they typically display. Winemaking is unremarkable, further proof that whatever makes these wines so compelling occurs in the vineyard and not in the cellar. Stainless steel is used for both red and white fermentation, with red wines fermenting in both traditional vertical tanks as well as roto fermenters not used in an abusive manner, as they are typically rolled over just twice a day. Malo occurs in stainless as well and the clear wine is transferred to barriques of both American and French oak for ageing. The problem with writing about these wines and that which affords me the opening to do so, is that there is no history to draw from. Tempranillo is not uncommon here, though it might be rare as it certainly is in this style, rich, powerful wines for ageing. On the other hand Cabernet Sauvignon and the other Bordelaise varieties are rare and recent here. Not only with Veleta wines but also in the region in general. It is a bit of a challenge understanding the Veleta wines, particularly the Cabernet based wines, but what does shine through in almost all the wines, making them easy to at least recommend, is a nervosity, a tension, and brightness that is unusual in Cabernet, but particularly unusual in wines, all wines, that are making 15% alcohol, if not more. Yes these are ripe wines, but without the fatal flaw of so many ripe wines. There is no flab here, no jamminess, no tiring wall of fruit. There is instead, earthiness, liveliness and freshness. It is an impressive moment, that moment when you’re sloshing around that 15% Cabernet in your mouth and you think of its transparency and cut. It doesn’t happen all that frequently, so when it does it’s surprising! Which is not to say that Juan and Nola have figured everything out, vinously speaking. There are still the powerful tannins of Tempranillo that sometimes can get a bit out of scale, and the use of oak perhaps can be dialed in a touch more subtly in some wines, but in general these are compelling wines, unique and with a distinct profile worth any wine lover's attention.